Katalon is a very precious tool for all of us. I am trying to help participating on forum and providing feedback. I have a test suite with 2 test cases. One of the test case is run with 13 scenarios/links from an Excel. So it’s run takes some time ~>10 minutes. Another particular thing about my suite would be that I have this test case calling another test case inside, but it works very well on that part. **The Log Viewer should show progressively 1/14, 2/14, 3/14… a review of current execution of 0/14 runs but this does not progress at all. **The issue is that the Log Viewer shows a review of current execution of 0/14 runs but this does not progress at all. It only reaches 14/14 at the end of the run. What I noticed is that, on the headless Chrome run, this review is correctly listed during the execution progress. **On the same scenario described at point 1, with reporting setting made to record video of both successful and failing test case runs. **## Actual Behavior - **the video recording of the execution is not successful , all I find in the Reporting Video folder is a file named “test_1.tmp” with 0 kb, so something must go wrong there. This seems to have to do, again, with the 13 scenarios/links from Excel test case that takes >10 minutes to execute, because if I am running only test case 1 in the suite, I find the videos as expected in the report folder. We are here trying to help you. 1. Looks this this issue does not always happen, is that right? Because based on your posted issue, I can see that it does not happen on Chrome (headless) but on IE instead. 2. Have you tried with Firefox and see if it happens in Firefox? Issue no 1) is present when running the test suite on Chrome, IE, Firefox (did not try on Safari at all). The only way I see it listing as expected is on Chrome headless. The Console tab is updating information as epxected, after each step. Only the ‘Log Viewer’ seems frozen. I am not sure I understand what you mean by “Is that abnormal execution on IE executed successfully”. This issue appears on all browsers executions, it is not relevant that left run in the printscreen was made on IE and right run was made on Chrome. In left printscreen I have runned One test case + 13 iterations of another test case => no video recorded. In right side of the printscreen I have deactivated the second test case(13 excel links) from the test suite and only run it with the first TC active. In this case the video was there as expected, both in the UI and in the Report->Video folder. From the katalon log file, can this be relevant? Does this issue always happen in all test suites, or is it just happen for this specific test suite? Can you help to try to remove all test cases from that test suite, then add one by one previous test cases and execute it to see if there is any specific test case causing this problem? I’ve figured out the root cause of your issue already. 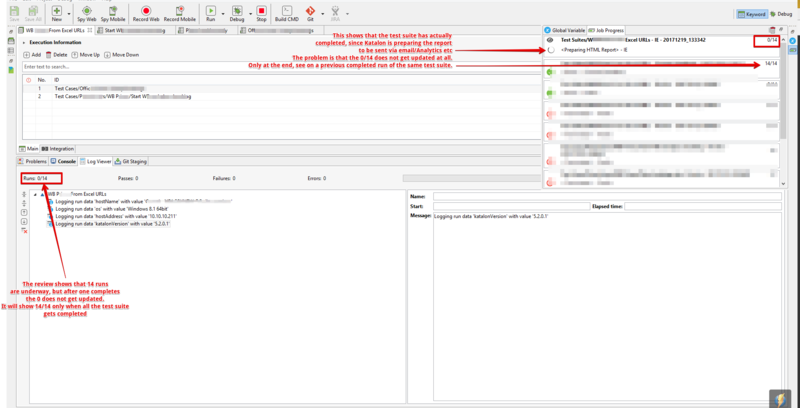 This issue happens when you enable video capturing option and execute a test suite using data-driven approach, so that’s why Log Viewer doesn’t show real-time logs upon execution. I’ve added a ticket for it and it will be fixed in next release. As you can see in the screenshot the log viewer and report folder is always empty for both firefox and chrome, headless or not. However, if you navigate to the folder you can find video and screenshot if there is some failed tests.